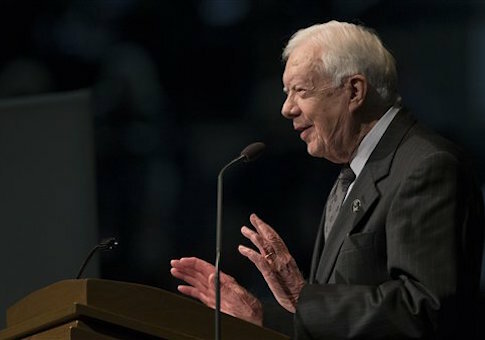 The Carter Center, the nonprofit organization founded by former U.S. President Jimmy Carter, confirmed on Thursday that Carter corresponded with Russian President Vladimir Putin about Moscow’s intervention in the Syrian war and provided reports and maps to the Russian embassy in Washington. The Washington Free Beacon reported on Carter’s recent comments about Putin, in which he said the two "have a common interest in fly fishing" and have exchanged email addresses. Carter said he offered to send maps of the Syrian conflict to Putin amid reports that Russian forces have been targeting U.S.-backed rebels, not the Islamic State terrorist group as Moscow has claimed. "So in the future, if Russia doesn’t bomb the right places, you’ll know it’s not Putin’s fault but it’s my fault," he said. The Carter Center closely follows events in Syria and regularly publishes reports about conflict developments on its website. These reports are publicly available and are forwarded to all interested parties, including Syrians across political divides and governments in the west and in the region. A recent report details Russia’s ongoing airstrikes in Syria, underscoring that the vast majority of the airstrikes do not target ISIS, as the Russian government asserts. Former U.S. President Jimmy Carter brought the Carter Center’s published reports and maps on the Syrian conflict to Russian President Vladimir Putin’s attention on Oct. 15, and his office shared a copy of the same publicly available online report and maps with the Russian Embassy in Washington on Oct. 19. It remains unclear what the Russian embassy will do with the maps and reports from the Carter Center. Reuters reported on Wednesday that nearly 80 percent of Russia’s airstrikes have targeted areas not controlled by the Islamic State, including the northwestern provinces of Homs, Hama, Latakia, Idlib, and Aleppo. This entry was posted in National Security and tagged Jimmy Carter, Russia, Syria. Bookmark the permalink.